JGI works to protect chimpanzees and other primates by supporting sanctuaries, law enforcement efforts to reduce illegal trafficking and public education to protect endangered species in the wild. Without sanctuaries, law enforcement officers would be unable to confiscate chimpanzees from great ape traffickers or hunters as there would be no place to take them. Without education programs, community members would not realize that they should alert law enforcement agencies about poachers or that their activities were wrong. JGI is now seeing an increase in arrests and prosecutions as a result of greater application of the law, but it is imperative for this work to continue. Dr. Goodall's research made some important discoveries about the chimpanzee that had previously been unknown to science. She was the first to witness a chimpanzee constructing tools to help collect food, and discovered that chimpanzees supplement their omnivorous diet by hunting. Chimpanzees also have a darker side to their natures and, while at Gombe, Dr. Goodall witnessed a four year war between two chimpanzee bands. For more information on important scientific discoveries regarding the chimpanzee click here or here. Chimpanzees (Pan troglodyte) are one of the closest animal relatives to the human. Recent research has shown them to have the 95% of the same DNA. They are native to the Congo Jungle where they make their nests in the trees and maintain a diet of fruit, nuts, insects and small mammals. They are also highly social creatures, and live in large communities with a strict hierarchy, communicating to each other through a variety of calls and sounds as well as touch and body language. 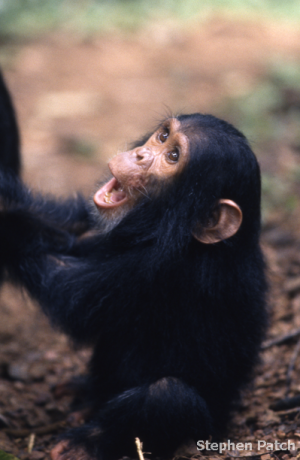 For more information on the biology and communication of chimpanzees click here. Dr. Jane Goodall knows two things about conservation: it cannot happen without involving a region’s human stakeholders, and the best way to promote it is through educating children on its importance at a young age. JGI works directly in four African countries to increase the public’s knowledge about the environment and conservation so that communities will take an interest in how sustainable practices improve their lives; projects such as public awareness billboard campaigns, school-based programming and community outreach all play a part in our work in the field. And Jane Goodall’s Roots & Shoots program works in over 130 countries around the world to support youth-led community action plans that help animals, people or the environment and spread the message that every individual’s efforts matter. Environmental education empowers people to care about their world and to take action ensuring its survival and well-being. This is the legacy and vision of Dr. Jane Goodall to empower young people to create practical solutions to big challenges. For more information on how conservation can increase the population of wild chimpanzees click here. Because chimpanzees are so biologically and socially similar to humans, they offer us a great deal of insights into our evolutionary past, as well as into our future. As we observe and document the world of chimpanzees, we learn more about our own behaviors and social patterns, our impact on the ecosystem, and even our ability to spread disease. The Jane Goodall Institute (JGI) manages chimpanzee research at multiple sites, including Gombe National Park in Tanzania and the Tchimpounga Chimpanzee Rehabilitation Center in the Republic of Congo. For information on Gombe National Park and Tchimpounga click here. This page was last modified on 5 July 2016, at 15:55.